I started this blog to share what I do. My hope being that in some way it would encourage others to get out into the shop and make things themselves. I have basic tools and try to use materials that are accessible to everyone. I’m just an average guy with average skills, if I can do it, so can you. Anyway, the point of my blog is to encourage and, dare I say, inspire others to make things and it thrills me to no end when that actually happens. So I’ve created a page upon which I will post project photos that readers send in to me. 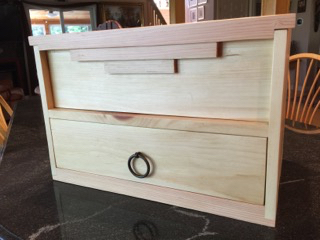 I started the ball rolling with the owl that David G. recently completed and submission number two comes from Doug F. This past summer I designed and built my Hillbilly Hobby Tansu and I received an Instagram notice from Doug that he was building a version of his own. So I contacted him the other day and asked if I could share photos of his version here on my blog. He graciously agreed and sent me a couple of photos. 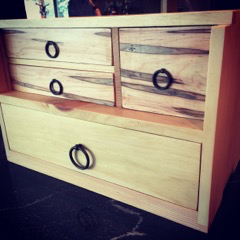 I think he did a fantastic job and the spalted drawer fronts are awesome! This entry was posted in 9-Reader Submitted Photos, Thoughts-Views. Bookmark the permalink. No time soon You’ll have a section “Readers Questions” and “My Lost Art Press Booklet”! Its a very nice privilege to see your blog growth journey! Its a healthy one! Carry on Greg, Carry one!!!! !